FULL TSTRAP WARRANTY - If you're not completely satisfied with your purchase of this band, simply let us know and you'll be offered a FULL refund or replacement, no questions asked. Enjoy this absolutely RISK FREE purchase today by clicking the yellow 'Add to Cart button' above. Imported; CALF SKIN LEATHER: Select from imported Italian calf skin leather. Stainless Steel Butterfly Buckle, Waterproof Watch Strap,Breathe freely and Absorb sweat. The leather is very nice, classy and stylish: It might be a little bit stiff when first taken out of the package. Bend it forth and back for some time or wear it for a few day, it will become quite soft and comfortable to wear. FREE SPRING BARS AND TOOL - Every watch strap comes with 2 replacement spring bars and the spring bar removal tool. 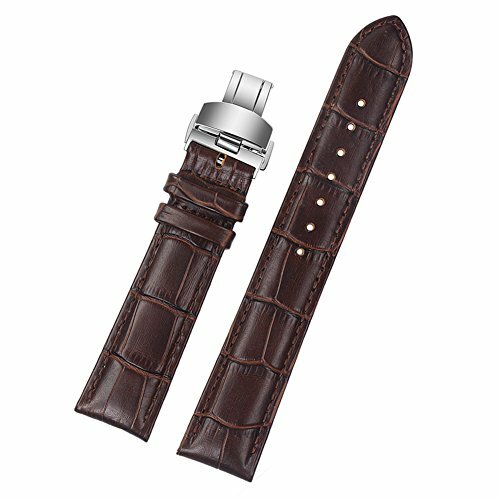 No need to buy a separate spring bar to your brand new watch strap. If you have any questions about this product by ViuiDueTure, contact us by completing and submitting the form below. If you are looking for a specif part number, please include it with your message.